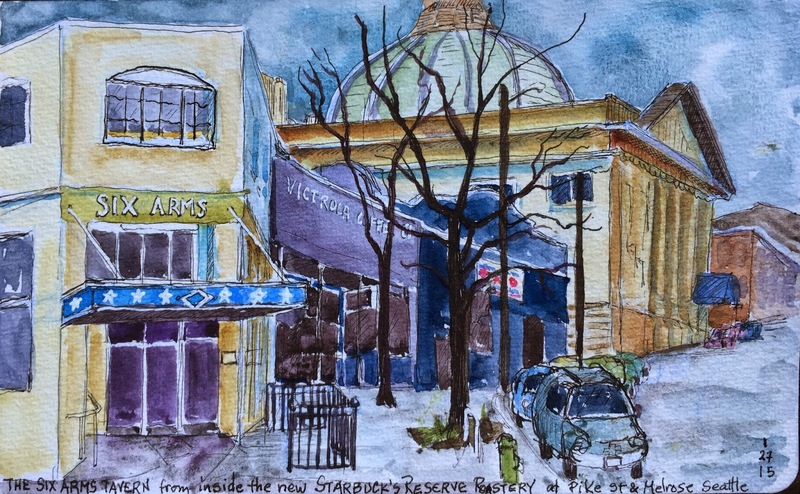 When the Ad Hoc Urban Sketchers explored the new Starbuck's Roastery at the corner of Pike and Melrose Streets in Capital Hill, I had started a second sketch, of this view looking east, up Pike Street, where it curves and heads uphill slightly. So when I had an errand in that area this week, I went back in to finish my sketch. Notice that the Six Arms, another favorite Ad Hoc sketchers haunt, sits right across the street. And that domed structure is First Covenant Church.